Posted on May 17, 2011 | by cookwithwhatyouhave | Leave a Comment on Simple Pleasures? I shop at my neighborhood farmers market (and a few others too). The neighborhood one is small with only a few produce vendors right now. There will be more later in the season. There isn’t a wide variety of produce right now and I like it that way. It simplifies my life. I have fewer choices but all the choices are fresh, delicious and beautiful (and come in more shades of green than you can imagine). I have an easy time deciding what to teach in my classes and feed my family. Now on to the trickier subject of how simple shopping like this is for the average Joe/Jane. Farmers markets have been popping up all over the country and the recent attention to food deserts (neighborhoods with little or no access to fresh produce and other food supplies) is helping. But many neighborhoods lack farmers markets (or even grocery stores with good produce) and the limited market hours don’t work for everyone. My neighborhood market does accept SNAP cards (formerly known as food stamps) and even gives shoppers using their SNAP card an extra $5 to use at the market. But we have a long way to go to make the way I shop more prevalent. I’m headed to New York City later this week for a board meeting of Slow Food USA. 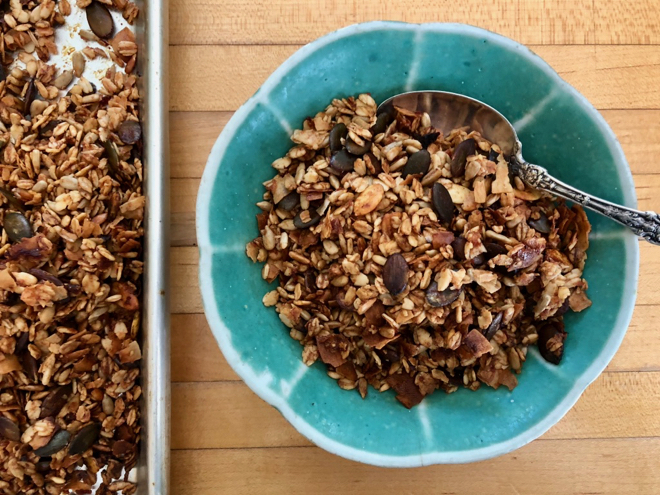 And we’re going to be talking about just how we continue to build a movement in this country to make access to these simple, but pretty critical pleasures, a reality for many more people. 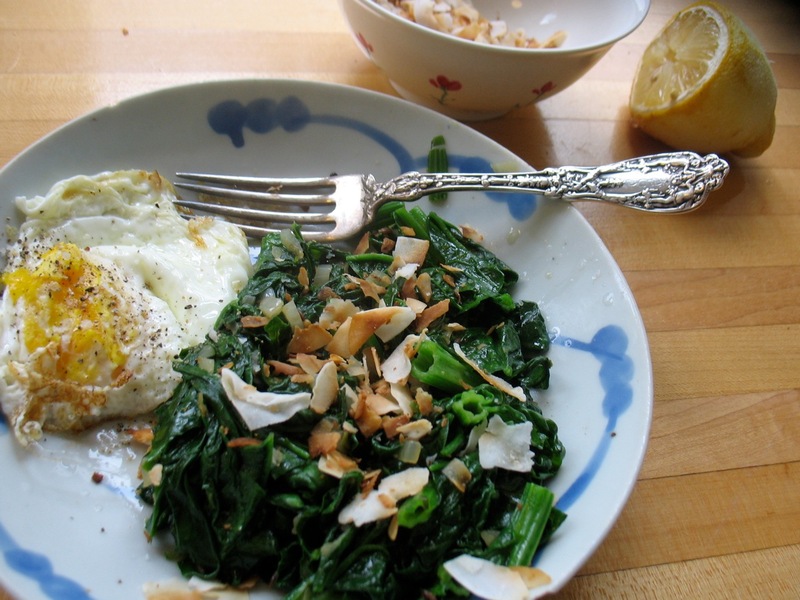 Spicy Spinach with Toasted Coconut. One of my green-hued market purchases last week was a lovely bunch of spinach. And thanks to Heidi Swanson, it turned into a perfect lunch. 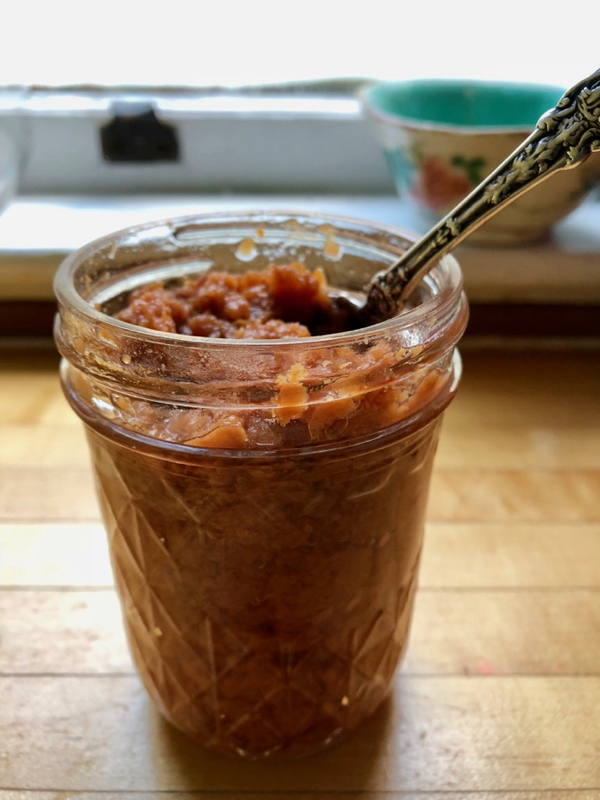 There’s been a lot of love in the food blogosphere for Heidi and her new book Super Natural Everyday lately and I’ll happily add my accolades to the mix. This recipe is not from her new book but from a recent post of hers. Enjoy!